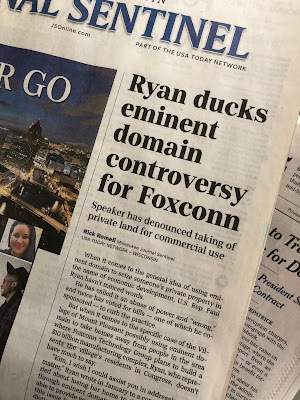 The Political Environment: Paul Ryan, like a duck.. Note to the high schoolers marching 50 cold-weather miles to GOP House Speaker Paul Ryan's Janesville office. "As Paul Ryan ducks Trump indictments..."
Paul Ryan avoids town hall meetings...declines comment on Trump.